My last update focused on our recent travails–specifically, Cathy’s car accident and our persistent harassment at the hands of a professional intimidator. Since then, our car has been repaired, and it seems to be running almost as well as it did before. Our troubles with the property dispute got worse before seeming to get any better. In fact, it may be some time before we can say for sure that it’s all over. I will say no more on the matter except that our lawyer has told us that we have strong grounds to sue the new “owner” (the court may yet decide that he never had any legitimate claim on the property) after all that he has put us through; and although we don’t want to sue anybody, we’re prepared to do so if he causes us any more trouble. Aside from the seed of potential for further difficulty in this one area, which will hopefully vanish without sprouting, things appear to be looking up for us. First, the biggest news: Cathy had her last radiation treatment on Thursday, December 30th. After nine months, she has completed the entire course of treatment prescribed at the very beginning by her oncologist. To recapitulate, she went through six months of chemotherapy, then surgery, and just over six weeks of radiation. Throughout it all, she remained enrolled as a full-time student, taking prerequisites for nursing. (There were brief flirtations with pharmacy school and PA school.) Even after her surgery, when she had the fluid drainage tube coming out from under her arm and connected to a bulb that was strapped to her side, she continued attending classes and lab exercises. She studied hard and took her final exams along with everyone else before finally resting for Christmas vacation; but even during the vacation, her rest was interrupted by early-morning trips to MD Anderson for her radiation treatments. Finally, on December 30th, we went with her parents for her last treatment. 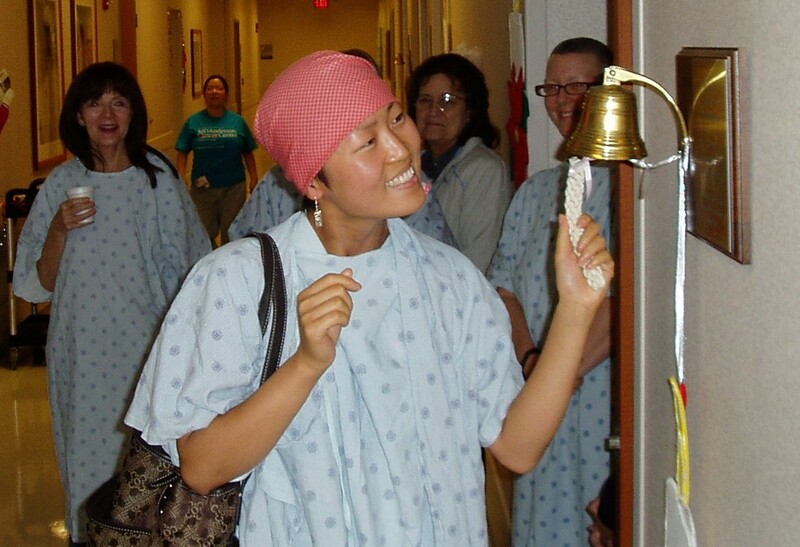 She got to ring a bell, as she had done at the last chemotherapy treatment, and she got hugs and congratulations from the nurses and other patients. We now pray that her battle with cancer is truly over, and that we can move forward without fear. The fall semester at HSPVA wrapped up nicely. My students and the HSPVA community have all been very supportive and sympathetic with us in our struggles. On December 22nd, we moved. Cathy’s parents helped us pack all our things during the preceding days. We are now almost fully unpacked. It was not something we would have wanted to be doing over the holidays, but things had become so unpleasant at our old apartment complex that when an acquaintance contacted me to offer us a place to live rent-free, we decided that it would be best to accept the offer. That was our biggest Christmas gift, and it has been a miraculous and timely blessing for which we are extremely thankful. The end of Cathy’s treatment and gift of a place to live have given us a pleasant end to what was otherwise a largely unpleasant year. A friend told me over lunch that his new slogan is, “Life is a team sport.” He doesn’t like the image of the lone cowboy fighting and living on his own. Life without community and fellowship is hollow and less meaningful (if not meaningless). As I consider our experience of the past year, I agree wholeheartedly that without support from our family, friends, and church, our burdens would have been far too much for us to handle, and I cannot even try to imagine what would have become of us. Therefore, I would like to close 2010 by expressing our immense, heartfelt thanks to all of you who have supported and encouraged us in any way at all. Because of you we are able, despite all we have faced, to look into the future and smile. May 2011 be wonder-filled from beginning to end! Thank you for sharing. Indeed, life is a team sport! Thank the Lord for His Body! What a beautiful pic of our girl! I am so, so joyful for all the love, support, and prayers you’ve received! You continue to be in my thoughts and prayers from over at The Village School. I pray the hardest times are behind you and you can have a clean slate to move forward! Please let me know if there is anyway I can continue to help! I’m very glad to hear that you’re both doing well. We miss you over at Village but it’s great to hear good news about the treatment ending and everything looking up. If you were to come visit sometime, Mr. Rambow, you’d receive an extremely warm welcome.